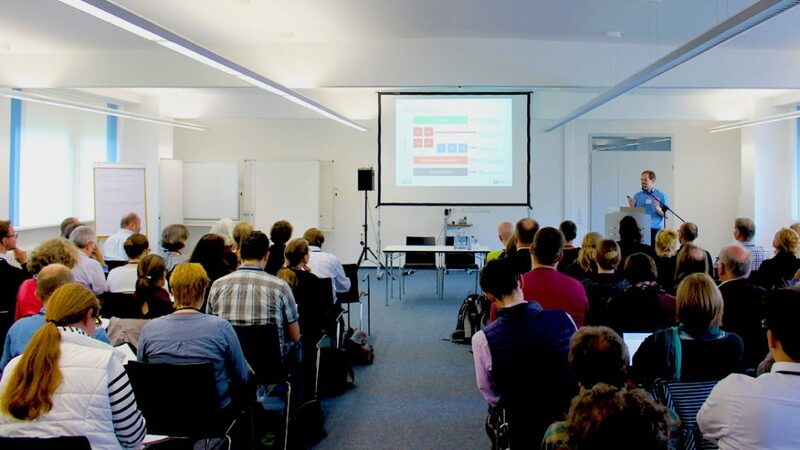 There was huge interest: More than a hundred participants from all German library associations gathered at the observatory of the University of Göttingen for lectures and workshops to gain an insight into the development of FOLIO. The organisers were the FOLIO team of the headquarter of the Common Library Network GBV (VZG) and the North Rhine-Westphalian Library Service Centre (hbz) with the kind support of the Lower Saxony State and University Library of Göttingen (SUB). The event started with a lecture by Kirstin Kemner-Heek from the VZG and Maike Osters from the hbz, in which the two speakers offered a general overview of developments in the FOLIO project since 2016. As part of the Open Library Foundation, the FOLIO community, consisting of the Open Library Environment (OLE) community, EBSCO, Index Data and other libraries and development companies, is developing a platform-based open source library system. Functional experts, developers and designers work together to design apps that, in addition to the functions of a classic integrated library system, also provide the opportunity to integrate future library requirements into the system. Michael Winkler, OLE Managing Director, explained the vision of FOLIO in his subsequent talk: It will be a community collaboration of librarians, developers, designers, service providers, and vendors working as partners to deliver technology solutions to improve library services. This gives libraries the opportunity to work with commercial providers on an equal footing and implement their ideas and needs independently. A first insight into the technology behind the platform was given in the lecture „Pushing Boundaries – FOLIO beyond the ILS“ (presentation slides) by Sebastian Hammer of Index Data . 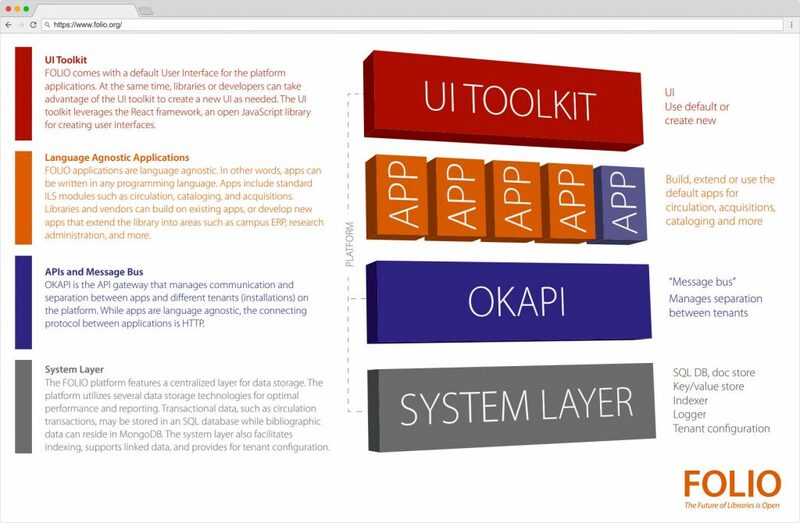 He presented the UI toolkit “Stripes” for the user interface and the gateway “Okapi”. Each FOLIO app is developed for a specific task – workflow management connects the individual apps and ensures communication via programming interfaces (APIs). As a result, no component will be too big to replace. For example, the presented concepts for an interlibrary loan app and another app for managing research data have already shown how future applications can be integrated through the modular concept. Speaking about “EBSCO’s motivation for the FOLIO project” (presentation slides), Roman Piontek, EBSCO’s Director of SaaS Innovation, outlined the role of EBSCO in the FOLIO project and its goals. EBSCO finances part of the development and provides resources as a partner to the community. In the future, FOLIO will also be offered as an EBSCO-designed service as a Software as a Service (SaaS), along with other integrated EBSCO products. Sharon Wiles-Young of the Lehigh University Library is a member of the FOLIO Product Council and reported in her presentation on how knowledge gained from the predecessor system Kuali OLE was incorporated into the development of FOLIO. As an essential aspect, it can be emphasized that the needs of libraries and their staff are taken more into account and that the system is developed in a design-oriented manner. To do this, requirements were collected on an international level and put together in a roadmap. This serves as a template for the development teams for the implementation of the various functionalities. At the end of the day, a demo installation of an early FOLIO version by Jana Maria Agne (VZG) and Martina Tumulla (hbz) was presented. The audience present got a first insight into modules in the areas of lending and acquisition. In the first lecture the following day, Felix Hemme (ZBW) presented the management of metadata in FOLIO. Currently, libraries are changing from pure print materials to management and verification of online resources. However, the currently used integrated library systems focus on paper-based inventory management, as they were partly introduced in the 1980s. A core aspect of the data model is therefore the ability to connect different knowledge bases (KBs) to FOLIO. Metadata of electronic journals and books will be easily usable in FOLIO for all business processes as well as for presentation at the user interface. Dr. Ingolf Kuss from the hbz showed in his lecture “Fishing in the Lake of Data – FOLIO Reporting” (presentation slides) which approaches the Special Interest Group Reporting (SIG) is pursuing in FOLIO reporting. He explained the concept of the “Lake of Data”, a variant of a data warehouse solution that is better suited for integrating external data sources into the central reporting system. In his second lecture on the FOLIO system operation “Orchester in a cloud – or in the data center – FOLIO system operation – SysOps” (presentation slides), he presented different possibilities for the installation and operation of the system. For example, container orchestration can provide automated deployment, management, and scaling of applications. As a result, peak loads do not present a problem because the cluster is automatically adjusted to the current system load. The first insights into the technical development of the previous day were expanded and deepened by Julian Ladisch (VZG) and Alfons Seelen (hbz) in their lecture “Technology – System tests – Development” (presentation slides). The technologies behind FOLIO bear names such as React / Redux, vert.x, RAML and PostgreSQL, and have been evaluated to ensure long-term operations by OLE community and EBSCO representatives. As a result, it was determined that FOLIO is technically on the right track. 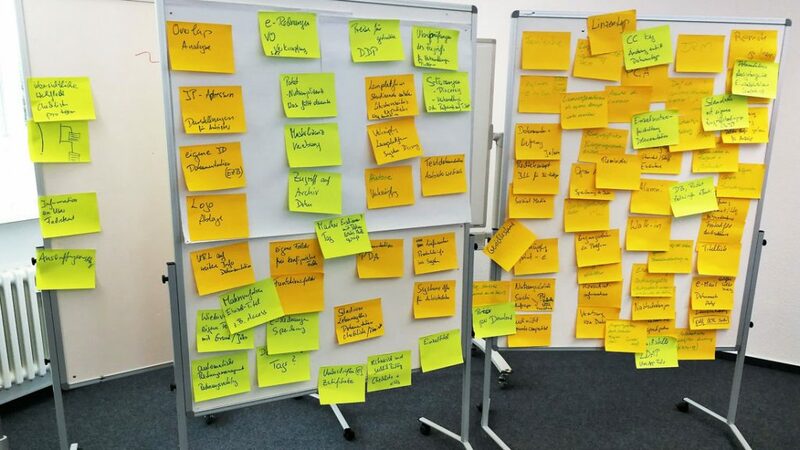 In order to ensure the quality of the code in future, the two German association headquarters VZG and hbz are committed to sustainable code within the community. Ian Ibbotson gave insights on the state of development of an application for the management of electronic resources (ERM) in his lecture “Background and Progress Update” (presentation slides). He described that the ERM systems currently used as standalones exist as silos, and data is exchanged as before over tables and in other formats. Interfaces between KBs, library and household systems, and library discovery systems are often absent and make data exchange difficult. By implementing the ERM component directly as a core component of FOLIO, the existing infrastructure such as authentication, authorisation, and reporting can be leveraged. This allows developers to focus on the actual requirements and build them into the system. The info day concluded with several workshops in which the participants were able to find out how the work in the SIGs works. The moderators brought up any current issues from the working groups and these were discussed together. Metadata management was about how FOLIO hierarchies between records should be made to meet the needs of German compound libraries. The internationally used set of rules Resource Description and Access (RDA) offers users different approaches. The mini-SIG Resource Access looked at material types and their influence on the loan. Colleagues put together material types and related functions for the loan. This resulted in an animated discussion on the subject and various experiences were exchanged. In the Acquisition/ERM workshop, issues of licensing and their representation in the system as well as detailed questions on invoice processing were discussed. In the technical workshop, participants examined the REST interfaces of the provided demo installation and recorded changes in JSON format. They were also able to try out the interplay of the modules encased as Docker containers during start and stop exercises. They discussed in-depth questions about the architecture and technologies used with FOLIO software developers Julian Ladisch (VZG) and Alfons Seelen (hbz). Autor: Felix Hemme is working as a Metadaten Manager at the ZBW.